Oh man, are Shorts’ pizzas only for Michigan too? Short’s Brewing Co. continues to grow. 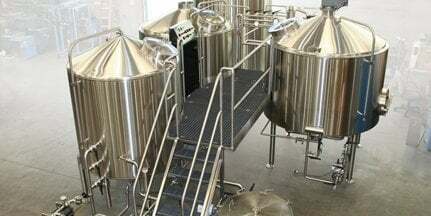 We reported earlier this year that the Michigan brewhouse brewed more than 1 million gallons of beer last year. That’s a 51 percent leap in sales, which is astounding, considering the company’s “Michigan Only, Michigan Forever” motto. This past week, Short’s Brewing (Bellaire, Mich.) expanded on its locally focused beer business even further with the final push to complete its pub expansion. The project has been in the works since winter of 2014, beginning with demo work in the building adjacent to the pub that would be home to the new kitchen, additional bathrooms and seating area. The primary purpose of this expansion was to provide much needed infrastructure to the existing pub. Short’s served food in its establishment, which previously sat 166 people, out of a kitchen that was 10 x 23 feet in size. The new kitchen is 24 x 55 feet and will provide kitchen staff with an efficient environment that can accommodate the continued increase in customers the pub serves each year. With the old kitchen arrangement, staff had to go to the lower level to access the walk-in cooler and dry goods storage. These are now at their fingertips in the expanded space, having been incorporated into the main level of the kitchen space. The new kitchen features 10 gas burners, two ovens, a fryer, a flat top, a triple decker sandwich oven, a hobart mixer and an automated dishwasher. The old oven will now be used exclusively for pizzas. A set of new bathrooms has been added for customers, located south of the existing dining area. Also added to better accommodate patrons is a new seating area with custom booths. Forty-two seats total have been added through this new space. Thirteen years ago, when Short began renovating the hardware store that would soon become Short’s Brewing, he committed to investing in his community and working where he wanted to spend his life. Now over a decade later, this expansion will allow Short’s to stay in its home in Antrim County, while being able to meet the demand, and staying focused on their Michigan Only, Michigan Forever philosophy.